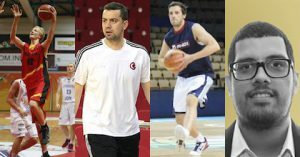 Belgian Tim Lambrecht, Turkey’s Ömer Ugurata, England based reporter Joe Hewison and FIBA Americas Communications Manager William Rosario come on Taking The Charge. Taking The Charge Podcast Episode 202: A big long show this week as we tackle a bit of the 2016 FIBA U20 European Championship with Tim Lambrecht of Belgium, Turkey coach Ömer Ugurata and FIBA Europe on-site reporter Joe Hewison and then we look in-depth at the 2016 FIBA Americas U18 Championship with FIBA Americans Communications Manager William Rosario. Episode 202: Youth season continues with an in-depth look at the 2016 FIBA U20 European Championship and the 2016 FIBA Americas U18 Championship.